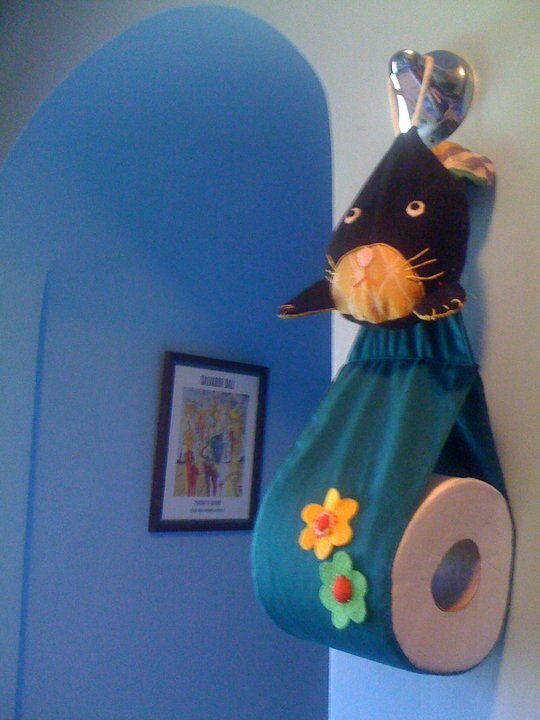 Having easily accessible rolls of toilet tissue in the bathroom can be a decorating challenge but there are lots of ways to display them either discreetly or humorously. This is a guide about making a toilet paper holder. Don't throw away those old cloth scraps you've accumulated. 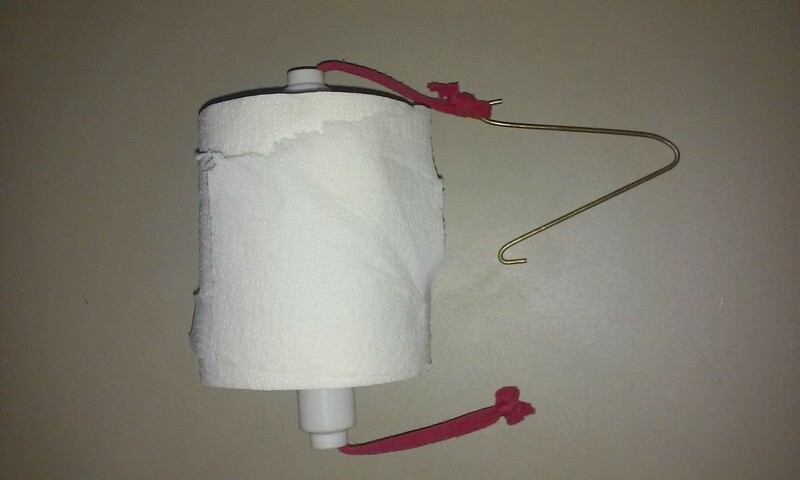 It just takes a few little pieces to sew together a toilet paper roll holder. If you aren't good with sewing, you can also use a hot glue gun (as I often do). The most important part is to make sure you have enough fabric to wrap around a roll of toilet paper, plus a couple inches. This bunny head has a pocket in the back so I can refill it with sacks of used coffee grounds, which work as a bathroom deodorizer! I take 3 metal empty coffee cans and cut the tops and bottoms out of two of them. I stack one on top of the one with the bottom still in it and solder it the bottom of the fist tube to the top of the can with the bottom. Then I take the third can (with both top and bottom cut out) and solder it to the top of the two that are already soldered. Decorate or paint as desired. I put one of the plastic lids on the bottom and one on the top to keep the paper clean. You can do just two and make a matching trash can. You can decoupage paper on them if desired. They make a really easy and inexpensive bath accessory. With the plastic coffee cans, I use to store beans, rice and other dried food items. They make really cure canisters too. You can spray paint them or cover parts of them with self adhesive paper. Makes great cookie jars, too. Really great for baked gifts. This is an old craft revisited and made much simpler now with a glue gun. 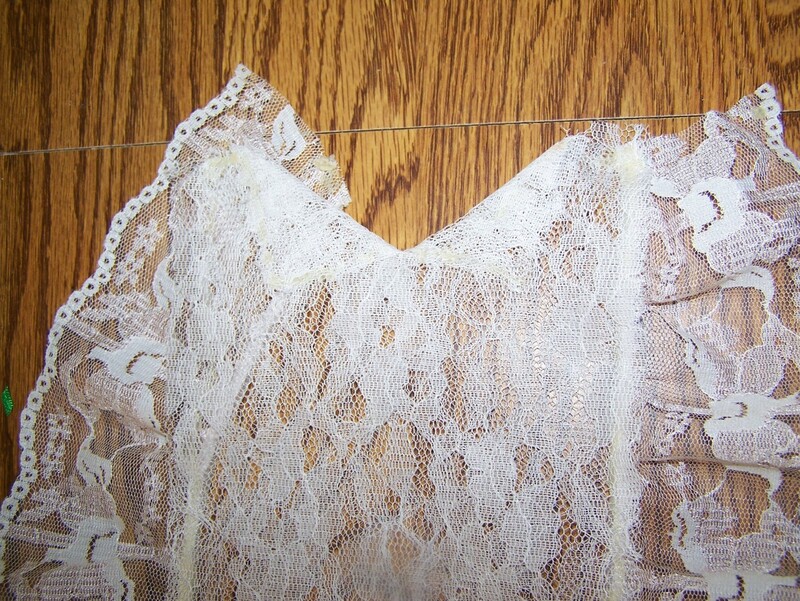 Cut and glue 32 inches of your 3 inch lace, down the 2 front edges only of the 6 inch lace, folding the end of the 3 inch lace under at the bottom. Bring the plain end of the 6 inch lace up toward the back even with the other end. Make a 2 inch slit in the center and glue the ends open in a V.
Wrap your wood ring with ribbon and glue the bottom of the ring to the bottom of the V.
Glue your 3 inch lace around the top edge of the ring. 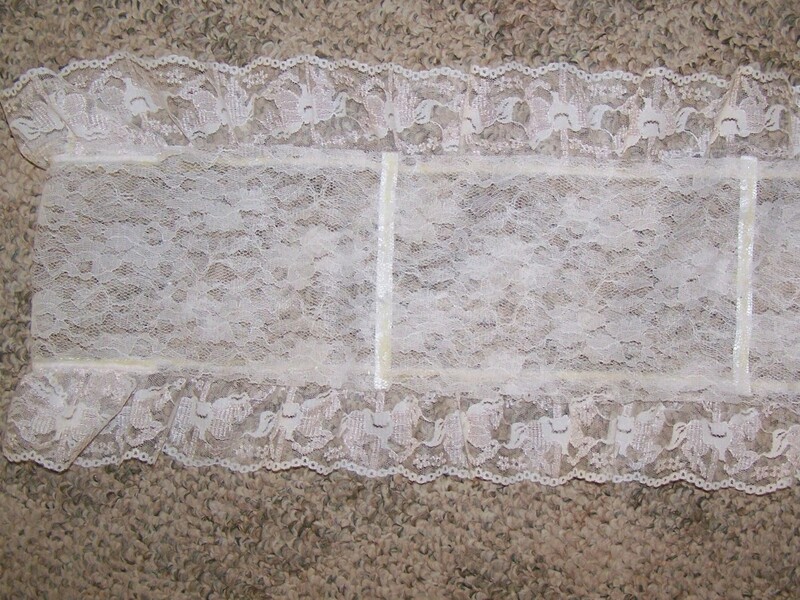 Measure down 9 inches and glue a piece a ribbon across from one edge of your 6 inch lace to the other, securing the two layers together. Repeat 9 inches below that one. 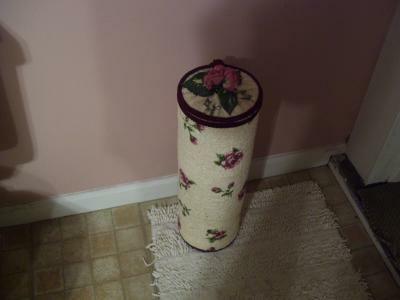 I am looking for a knitted pattern for a toilet tissue holder. 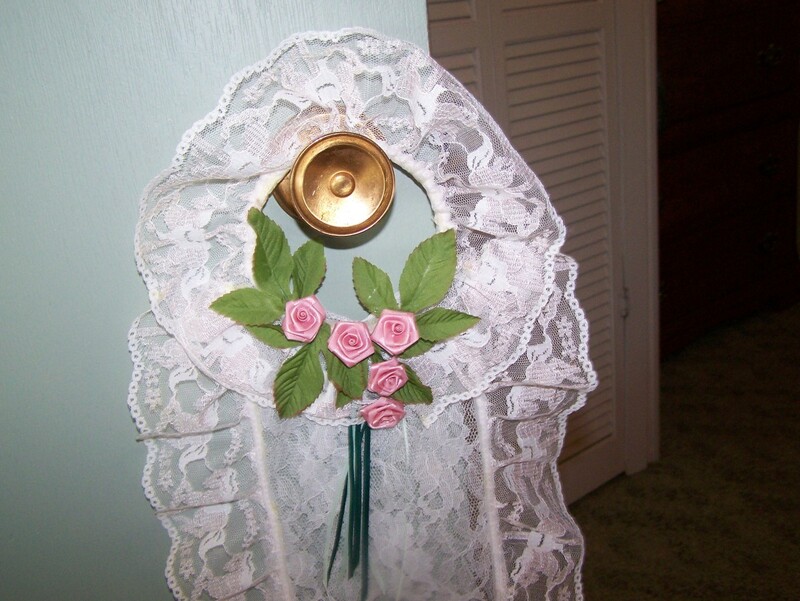 Just the other day, I saw a handmade toilet tissue holder at a flea market but it was already sold. I tried to take a picture so that I could attempt to make one when I got home, but thought that would be tacky. 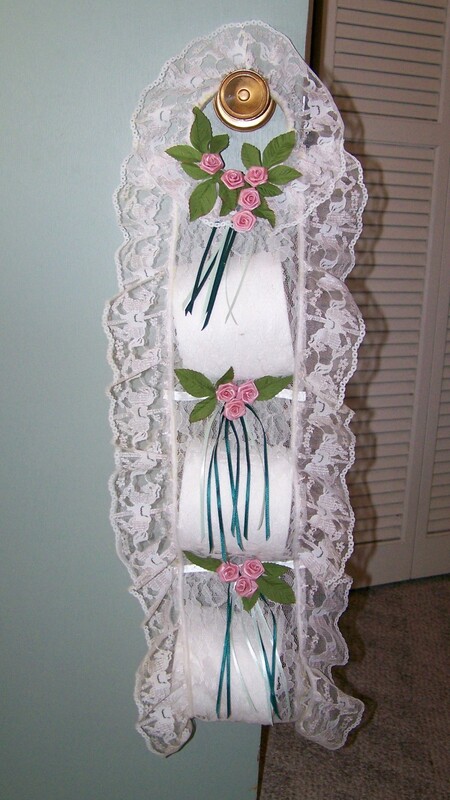 It was really nice, hung on wall, was knitted I believe, held 4 rolls, with lace around edges. Any ideas would be greatly appreciated. I don't know how to crochet so it would have to be knitted or sewn. Thanks you guys. Awesome post Barbara! Kudos to your daughter! I use an empty oatmeal box decorated to match my bathrooms (contact paper works well as it is easily cleaned as is the plastic top). They hold two rolls perfectly. An extra lid can be placed on bottom also to keep it free from bathroom "spills"
I built this toilet paper holder for my daughter's birthday. I think it is just great. 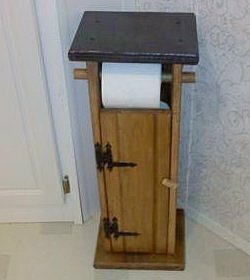 Do you have any ideas on how to make a toilet tissue paper holder easily?